Donald Trump speaks as Hillary Clinton listens during their third and final presidential campaign debate at UNLV in Las Vegas, Nevada, Wednesday. LAS VEGAS — Republican Donald Trump and Democrat Hillary Clinton clashed on abortion rights on Wednesday as they opened their third and last presidential debate with a substantive policy discussion on the Supreme Court and the top issues it faces. 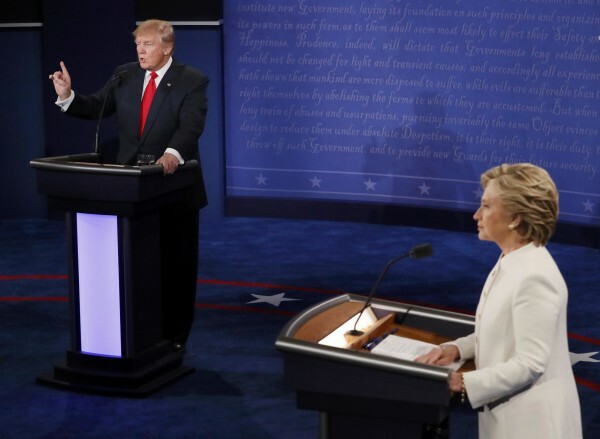 In contrast to the fiery personal attacks of the first two debates, Clinton and Trump had a sharp but issues-based exchange on abortion, gun rights and immigration during the 90-minute showdown. The candidates also battled sharply over the influence of Vladimir Putin, with Clinton calling Trump the Russian president’s puppet and Trump charging Putin had repeatedly outsmarted Clinton. Clinton promised to appoint justices who would uphold a woman’s right to abortion laid out in the 1973 Roe v. Wade decision, while Trump promised to appoint what he called “pro-life” justices who would overturn the decision. He has said in the past that Clinton wants to “essentially abolish” the Second Amendment of the U.S. Constitution guaranteeing a right to bear arms. Clinton said Trump had refused to condemn Putin and Russia for recent cyberattacks. U.S. intelligence agencies and the Department of Homeland Security have said the Russian leadership was responsible for recent cyberattacks on the Democratic National Committee and the leaking of stolen emails. “No, you’re the puppet,” Trump retorted. “Putin has outsmarted her and Obama every single step of the way,” he said in a reference to President Barack Obama. Trump refused to say that he would accept the outcome of the Nov. 8 presidential election, leaving open the possibility he would challenge the ultimate outcome. The New York businessman has raised concerns by claiming the election will be rigged against him. He has urged supporters to patrol polling places in inner cities to prevent voter fraud. Clinton said the women came forward after Trump said in the last debate he had never made unwanted advances on women. “Donald thinks belittling women makes him bigger. He goes after their dignity, their self-worth and I don’t think there is a woman anywhere who doesn’t know what that feels like,” Clinton said. She and Trump talked over each other, Clinton defending her ties to the foundation, saying “there is no evidence” of a conflict, while Trump said the foundation should return millions of dollars to countries such as Saudi Arabia and Qatar who treat gay people harshly. Trump, 70, was seeking to reverse his fading momentum in an election that opinion polls show is tilting away from him. Clinton, 68, leads in national polls and in most of the battleground states where the election will likely be decided. She has struggled to get past concerns about transparency raised over her use of a private email server for work communication while she was secretary of state. Trump campaign manager Kellyanne Conway acknowledged that her candidate went into the debate as the underdog. Trump has lashed out at what he calls a political and media system rigged against him, an apparent bid to discredit the process before the election takes place. Obama said on Tuesday that Trump needs to “stop whining” and make his case to voters. Trump’s daughter Ivanka, who has advised the candidate, said she thought her father would “do the right thing” and accept the Nov. 8 result, no matter what it is. When asked if she thought the election was rigged, she said at a Fortune “Most Powerful Women Summit” that the media had been “vicious” about Trump. Both candidates invited guests who could be seen as provocative. Trump asked Obama’s estranged half-brother Malik, who supports the Republican, as well as Pat Smith, the mother of one of four Americans killed in the 2012 attacks in Benghazi, Libya, who blames Clinton for her son’s death. Clinton’s guests include Mark Cuban, the billionaire owner of the Dallas Mavericks basketball team and a frequent Trump antagonist.